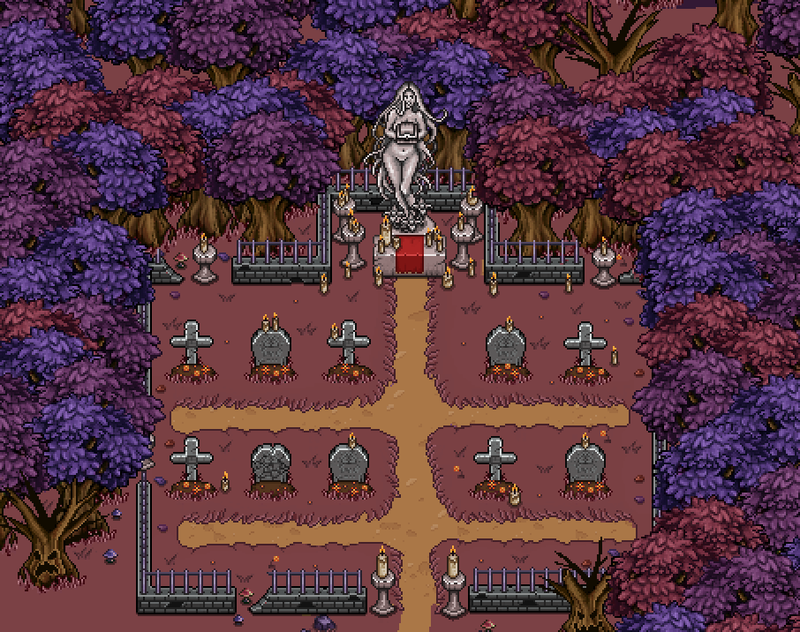 So the time is closing in for us to say farewell to the Halloween forest. 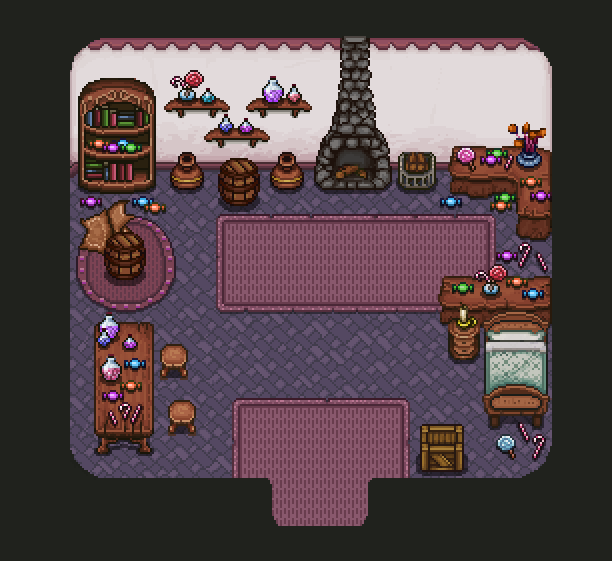 Although it has been a lot of fun to do something new and exciting, all the props have been made and now only detail work (like actually putting it all together in the game) remains. Last week was spent mostly on that note on the programming and animation side and will probably continue on like that during this one. 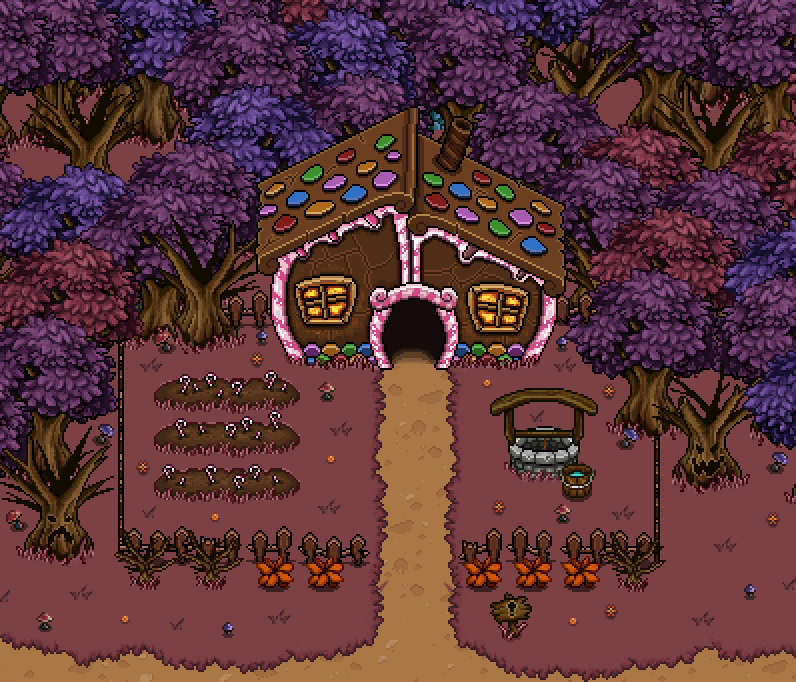 While we’re shifting our main focus from the Halloween Forest in order to connect it to the rest of the game, we’ll try to set some time aside to record a gameplay video of us fighting inside it some time in the coming weeks! These are the NPCs you will encounter along the forest! Who they are? Remains for you to find out! What we’ll do after this (and which Vilya has already gotten into, as you will soon see) is to return to the city of Evergrind, filling it with indoor designs and people. 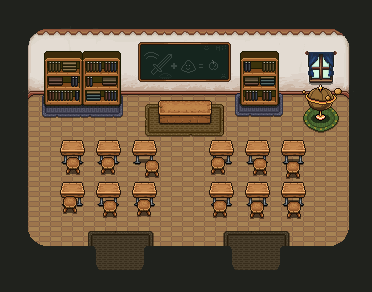 We’re also gonna look into adding more skills and expand our menu and level system in the near future, so look forward to that in the coming weeks! This is the Dojo, a place ruled by a great master of all fighting styles. Perhaps he can show you a new trick or two? Here you can learn details about monster types and other helpful hints and strategies that will make your grinding life easier. Click on the screens for enlarged versions! 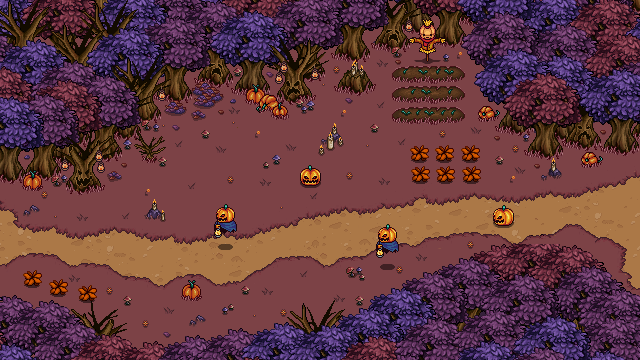 As promised, we’ve been crunching away with the Halloween Forest this week! 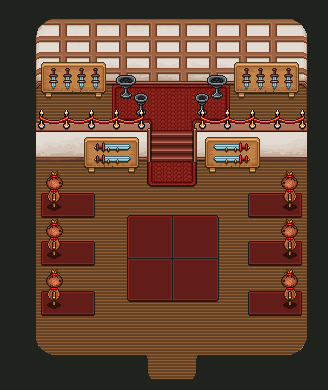 We’ve got the basic color scheme and props down, as well as nearly all of the enemies that will inhabit the region. 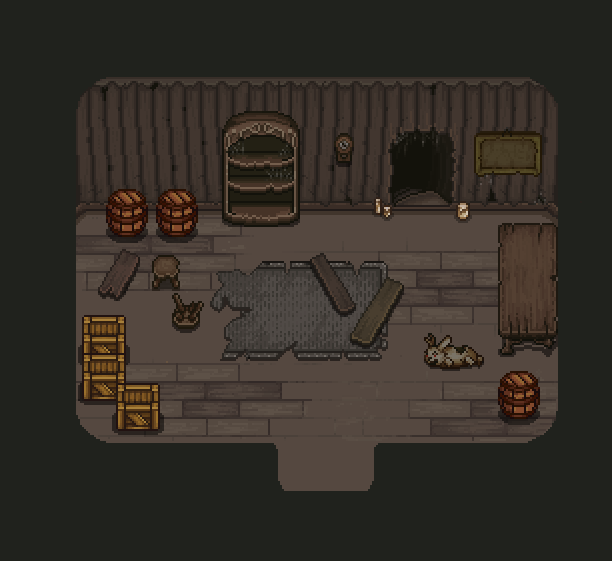 Apart from this screen, we’ve iterated the whole forest layout to something we feel pretty confident will work out, so what’s left now props wise is mostly bigger set pieces, like the witch’s cottage, and putting everything together in a nice way! 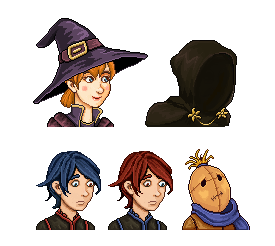 And below are idle animations for a couple of them! 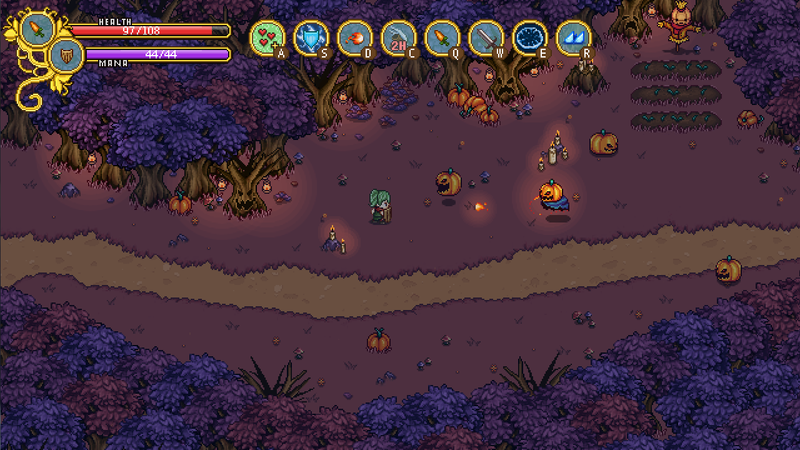 The flying jack o’ lantern is a ranged type, and fires small projectiles at the players. He also scales with the number of players, shooting more projectiles if there are many players. His flames can be blocked with a shield, or even reflected if timed properly! The scarecrow is a tanky, melee type that can withstand several hits before going into hitstun. Using the shield to find openings is a dominant strategy here. Finally, the ghost is a harass type enemy, which stays invisible until it is in position for an attack. It appears as it charges, so you have some time to react, but will fade away again soon after the attack is finished. You’ll want to dispose of these buggers as soon as you see them! They are trickster ghosts of sorts, waiting around for unwary travelers to play with. We’ll also be adding a plant enemy called Halloweed, which is an upgraded version of the flower you might’ve spotted in our videos. We’re still trying to nail his color scheme though, hence his absense in the lineup! He’ll use his vines to whack players that are close to him, but unlike his less agile brother, this guy will burrow and chase you underground if you’re out of his reach for too long! Encountering all of these enemies all at once would certainly be a daunting (and frustrating) challenge, so we’ll spread them out a bit and try to make sure the spawn compositions are varied and well balanced! 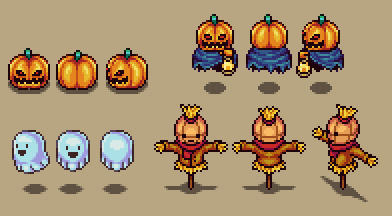 Next Week: Even more halloween stuff will see the light!